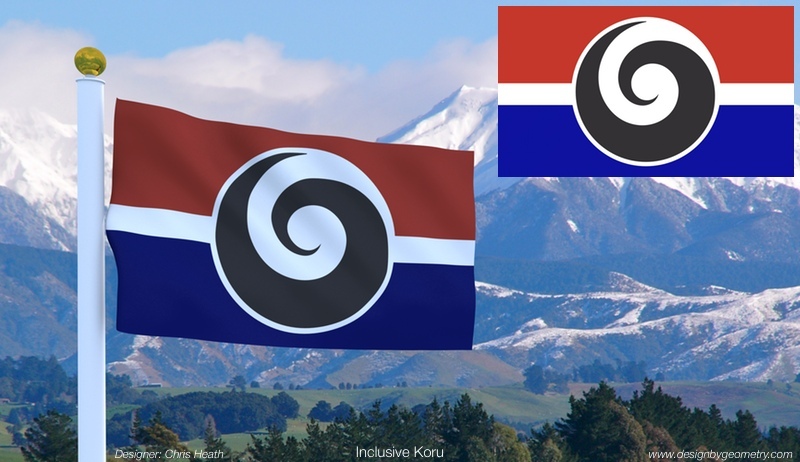 With a referendum on whether to change the New Zealand flag, the opportunity to submit a design is an opportunity that is not to be missed. Apart from its similarity to and being mistaken for the Australian flag, there isn’t anything wrong with the current New Zealand flag. However, if it’s going to change, I figured that offering a design or two wouldn’t hurt. Even though I experimented with a number of variations of each design, I settled on developing two ideas. 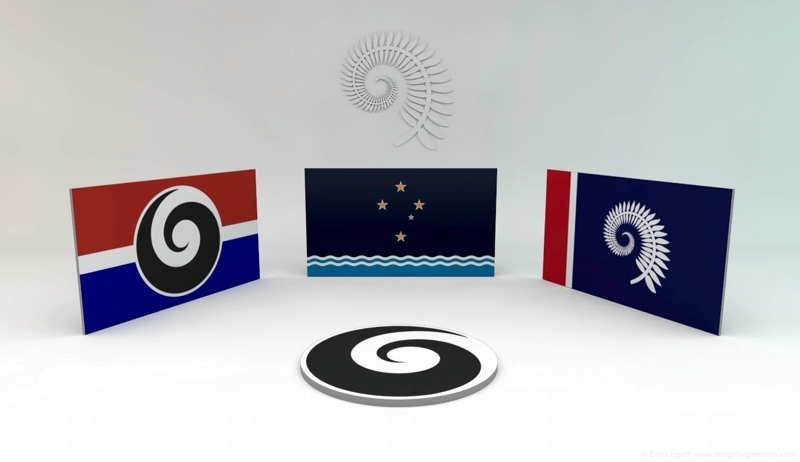 One idea features the Southern Cross, and the other features an emblem combining the Silver Fern and a Koru. 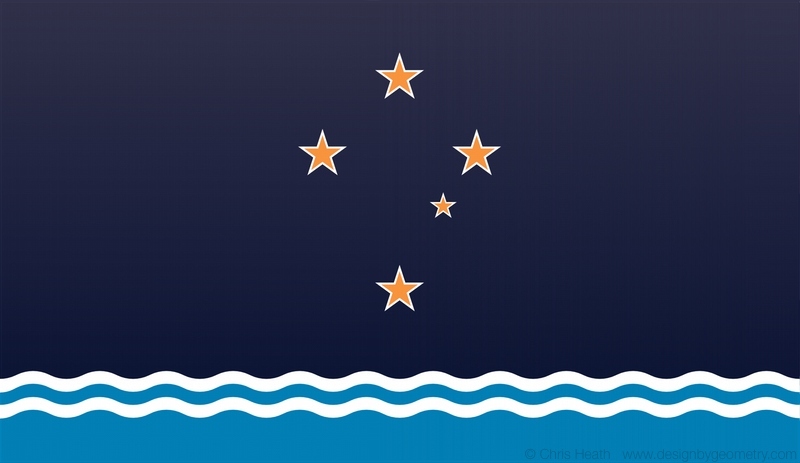 The first design incorporates the Southern Cross, and with New Zealand being an island nation, the ocean that surrounds it. It’s intended to be representative of what can be seen from the coast when looking out across the ocean. There are two colour variants of this design, one incorporating the traditional colours of the existing flag (red, white and blue), and the other being a break from traditional colours by incorporating gold rather than red stars and an almost teal blue ocean. For me, the gold colour better represents the colours of the stars in the night sky and the near-teal blue ocean sets the flag’s colours apart from other flags’ colours. Flags require elements that are recognisable from a distance. As with other flags that share the Southern Cross, the stars can be a little hard to discern from a distance, so the wave elements uniquely distinguish this flag from all others. I’m not a big fan of the silver fern as an emblem, but I do like the more abstract Maori Koru in its many and varied forms. The silver fern does tend to look like a white feather as many people have pointed out. So you may be wondering why I chose to incorporate a silver fern in the following designs. The reason is simply that after listening to a number of people, the silver fern appears to be a popular choice for the flag. The challenge was to come up with something simple, bold and most importantly, different to the current array of silver fern emblems that are based on each other. And of course, to come up with something that looks less like a white feather. This was perhaps the hardest challenge of all. 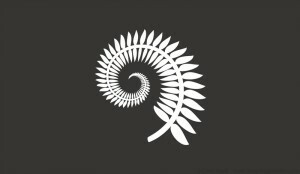 The idea I came up with was to wrap the fern leaf around a Koru. In a sense, there are two leaves. One leaf (Koru) represents the growth of our nations young, embraced by the mature leaf of our parents (or developed nation). 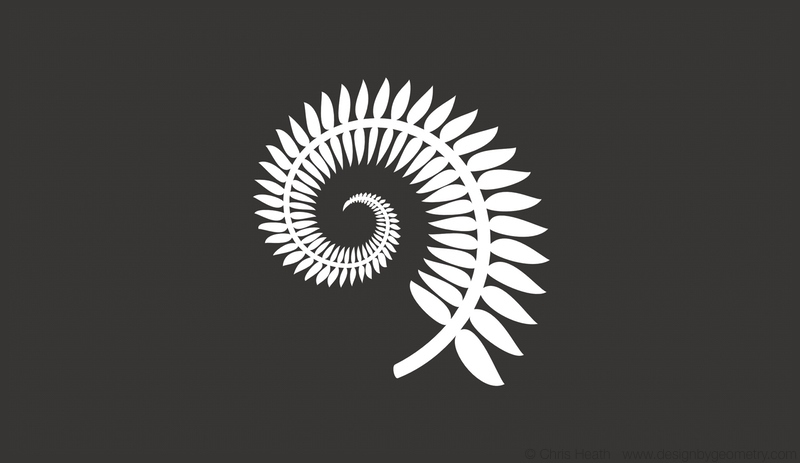 The Koru is a relatively abstract element representing the potential for continual growth and adaptation; the fully developed Silver Fern leaf is more naturalistic in style to depict a mature, nurturing and wise spirit. The bold blue Koru spiral helps to ground and balance out the lightness of the silver leaf. From a distance, where the leaf can lose some definition (a problem shared by all silver fern emblems), the Koru stands out. It’s a distinctive combination of curves that when used on a flag will stand out from the crowd on the international stage. For this emblem, I’m proposing three options (I could come up with more, but I don’t want to overdo it!). The first uses the familiar red, white and blue (above) colours of the New Zealand flag, and the other (below) replaces the red band with a lighter blue band (sky blue or teal blue) to embed the flag firmly in the Pacific. The silver fern sits on a backdrop of dark night sky for maximum impact. The third design is simplified by centreing the emblem firmly on a single coloured background and doing away with the vertical bands. The flag background could be any colour that contrasts well with white or silver. This design also looks balanced when centred on a square flag. Making an abstract silver fern look less like a feather is no easy task. The problem is that the more abstract the design, the more it is likely to be mistaken for a white feather. The only way to mitigate this is to look at the morphology of fern leaves, in particular, the point at which the small leaflets are connected to the leaf stem. It’s not going to solve the problem of miss-association with a feather. By retaining a detail that is unique to the growth of leaves; a detail that is not shared by feathers, no one can argue that the silver fern above represents a feather. The leaf detail I have retained is not shared by feathers. 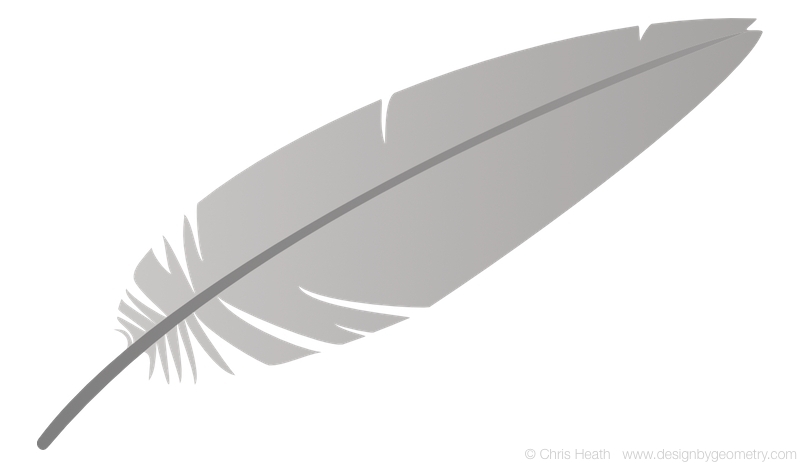 When a feather splits, it’s the vane that splits down to the rachis. The vane is made up of fine barbs that radiate out from the rachis and out of these barbs radiate barbules, and out of these barbules radiate hooklets. You would need a microscope to see the barbules and hooklets that make up what appears to be the surface of the feather. The end result of this is that when feathers tear, the tear forms between the barbs and can travel all the way down to the rachis, creating a compound leaf-like effect. By comparison, the fern leaf’s leaflets have their own stem which separates the leaflets from the leaf’s main stem. Unlike barbs that appear fused to the rachis of a feather, the leaflets closest to the main stem are generally not fused to the stem. Where they appear to be joined, the point of contact is minimal. This is one obvious difference between silver fern leaves and feathers. Even though some people might still see a feather when looking at an abstract fern leaf, by retaining a small morphological detail that is not common to feathers, the design can easily be argued to be a leaf; not a feather. Simplicity is all about removing whatever is superfluous to the design’s purpose and only adding what is meaningful. 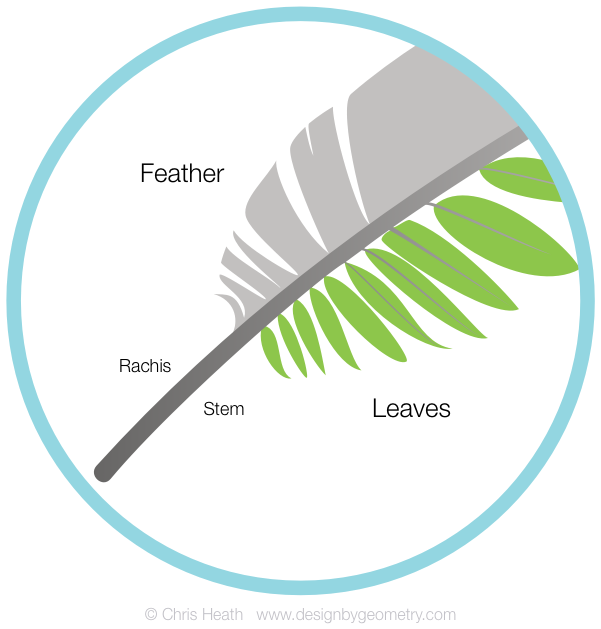 Many of the existing abstract silver fern designs are oversimplified to the point that they share more in common with a feather because they fuse the leaflets to the base of the stem. They look great, but lack the distinguishing detail required to rule them out as being representative of a white feather. 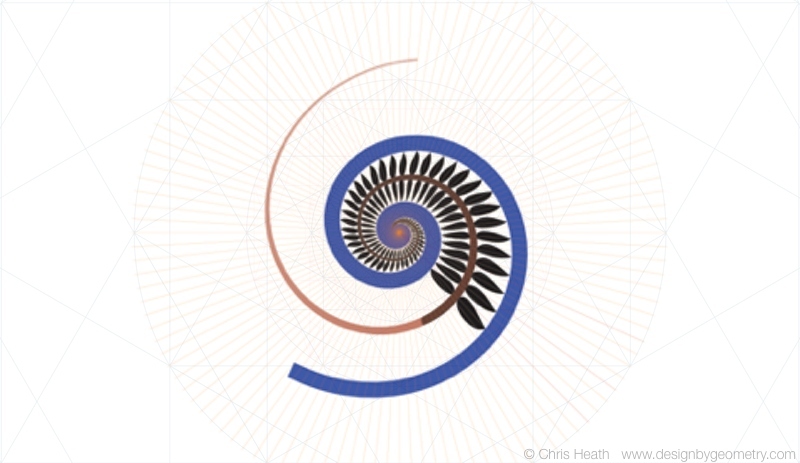 The following picture is one of the initial hand drawn concepts combining the Silver Fern with the Koru and based on a golden ratio progression of pentagons. In this example, the leaflets are fused to the stem and look feather-like! By comparison, the finished design minimises the connection that the leaflets have with the main stem without having to add an additional element; a branching stem that would make the design too complex. The proportions of these flags are based on the square root of three. That is, the length of the flag is 1.732… times longer than the flag is high (1.732… equals the square root of three). It’s an elegant rectangle that has some interesting properties. Similar to the root-two rectangle which can be divided in half to form two smaller root-two rectangles, the root-three rectangle can be divided in three to form three smaller root-three rectangles. Note: If you think you have never seen a root-rectangle before, go grab a sheet of A4 paper and fold it in half to form two A5 halves. A sheet of A4 paper is a root-two rectangle, as are A0, A1, A2, A3, A5 and A6 sheets of paper. The root-two rectangle is the only rectangle that can be folded in half to create two smaller rectangles that share the same proportions as the parent rectangle, which is why it’s such a useful proportion to use as a standard for paper. 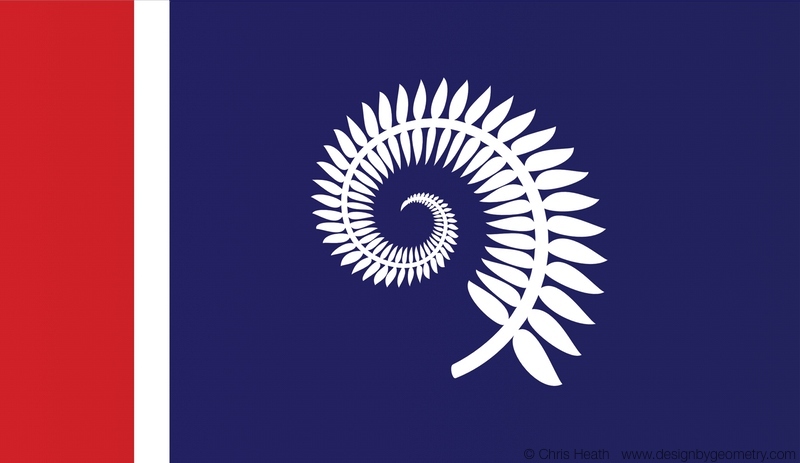 While my flags’ proportions and the layout of the elements are based on the square root of three, the golden ratio was loosely used to guide the design of the fern leaf. 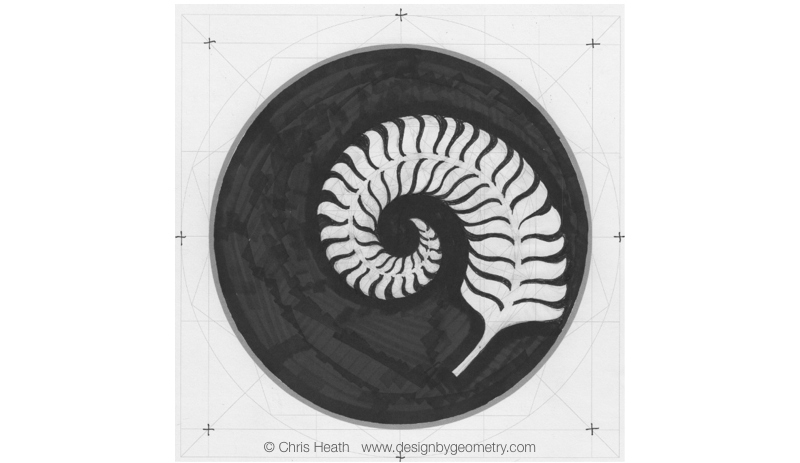 The reason for this is that the golden ratio better represents the pattern of growth in the natural world. While I wanted the regularity of a radiating grid to position the leaves, and proportions from the golden ratio, I didn’t want a design that was too perfect. As with all plants, no two leaves are ever exactly alike, nor are they ever geometrically perfect – I wanted to see some subtle variation in the design. Without this variation, the design could look overly contrived and become boring very quickly. The design’s leaflet shapes differ subtly from each other, just as they would in the natural world. 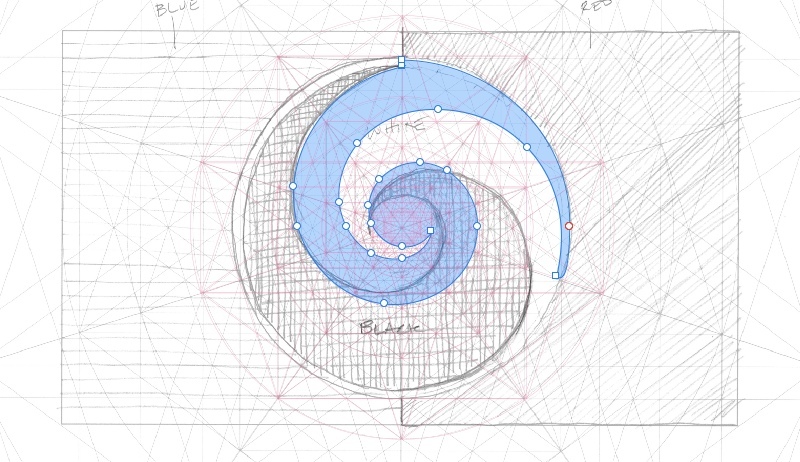 The curves of the spirals are ever so slightly off, just like naturally forming curves. This variability adds interest. The more it is explored, the more differences from geometric perfection can be found! Disclaimer: It is possible that other people have submitted similar designs. Apart from seeing a small sample of flag submissions when checking out the submission guidelines, and seeing some submissions printed in newspapers, I deliberately chose not to look through the existing submissions. While developing the ideas presented above, I did not want to be influenced by other designers’ work. Any resemblance, if any, to other submissions is purely coincidental. 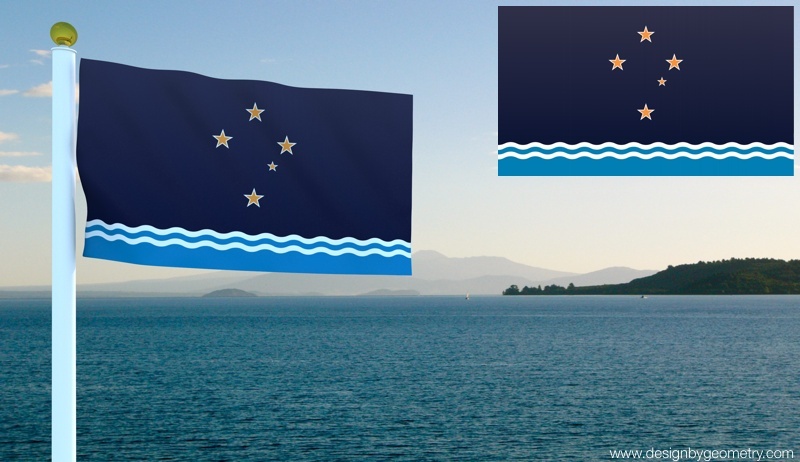 Note: If by chance any of these designs are shortlisted by the New Zealand Flag Consideration Panel Secretariat, copyright will be transferred to the Crown as per the Flag Design Terms and Conditions. After submitting the above flags, I checked out Gareth Morgan’s site. With one day to go before Gareth’s deadline for submissions, I thought I’d tackle his brief. our multicultural society – now and into the future. In terms of priority, acknowledging the spirit of the Treaty – that the partners agreed to share this land and ensure each other’s cultures thrive – is the critical element. This design honours the British settlers with the colours of the Union Jack. 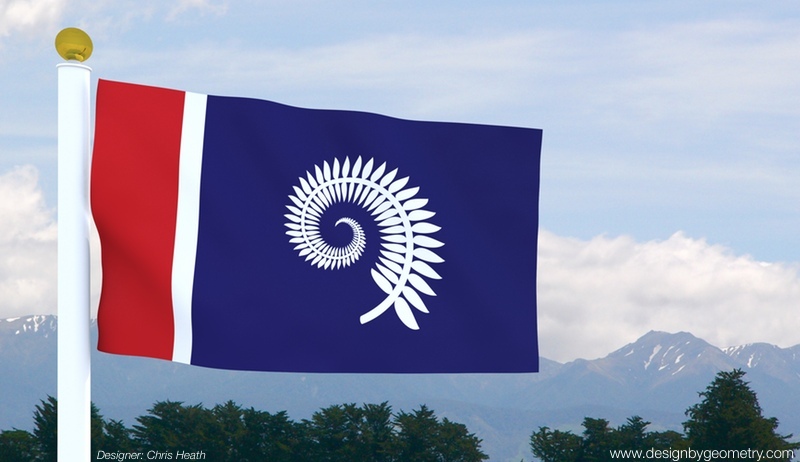 The bold white Koru contrasts with a dark grey background to strengthen the spirit of the treaty. Combined with the circle, a symbol of unity and inclusiveness, this Koru expresses the growth of our multicultural nation. The following picture is of the initial concept sketch, overlaid with the final curve in blue. Spirals are difficult to get right, hence the additional bezier points. The curve still needs a little more work; but not much. Initially, the plan was to divide the flag in half vertically; one side blue and the other red. This didn’t work where the two colours came into contact. A vertical white band down the centre to separate the two colours did not work either. In the end, after a bit of trial and error, horizontal bands were used. 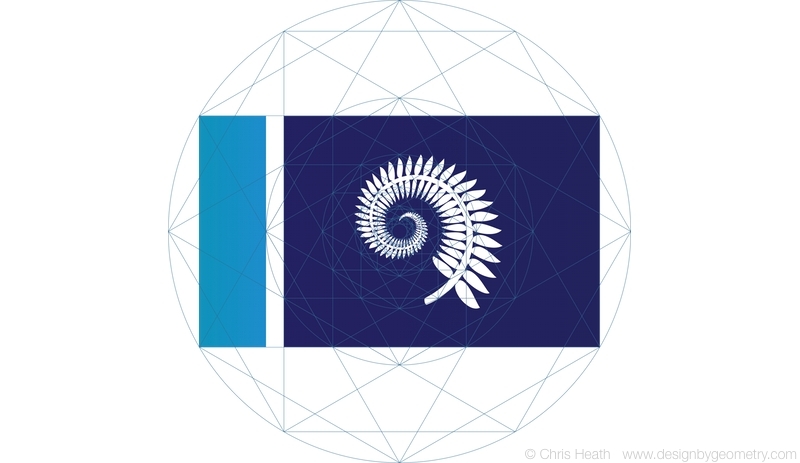 Like the other flags, the Koru was laid out on a progression of pentagons, and the root-three rectangle was used for the flag’s proportions. The horizontal white band is offset slightly. The intention here was to make a subtle visual correction by reducing the darker colours that dominate the bottom half of the flag. Want to create amazing icons? Learn how to harmonize your icons with IOS. Design Secrets Revealed! This book shows you how to design great app icons using the golden section. Specifically, it focuses on icons for the Apple platform, but the principles apply equally well to any artwork that would benefit from a geometric approach. What a great book. As an app developer your apps need a point of difference from the thousands of competing applications. With Chris's book and help we were able to give our the app the best opportunity of success.